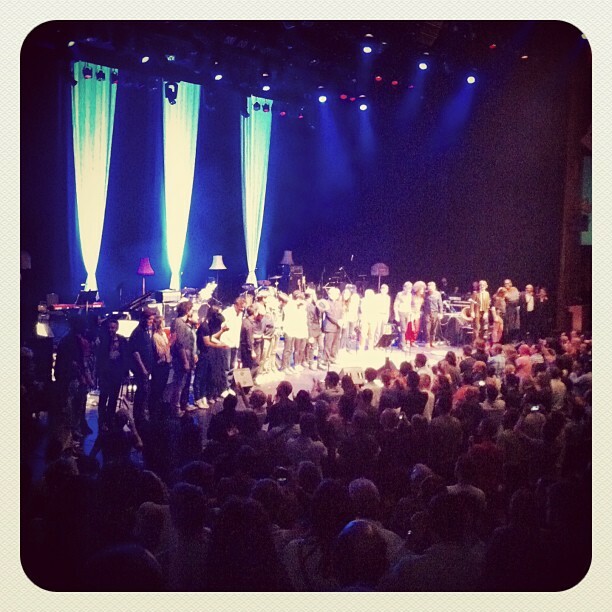 The star-studded line-up of artists taking turns on stage includes: Beck himself; Pulp frontman and solo artist Jarvis Cocker, Glasgow�s finest Franz Ferdinand, singer-songwriter Beth Orton, French icon Charlotte Gainsbourg, Joan Wasser aka Joan As Police Woman, Villagers front man Conor J O�Brien, acoustic indie trio The Staves, indie mavericks Guillemots, soul stylist Michael Kiwanuka and singer-songwriters James Yorkston and The Pictish Trail, with more to be announced. At the heart of the evening will be a specially-assembled house band featuring Seb Rochford (drums), Tom Herbert (bass), Dave Okumu (guitar), with music direction by Ed Harcourt and David Coulter. 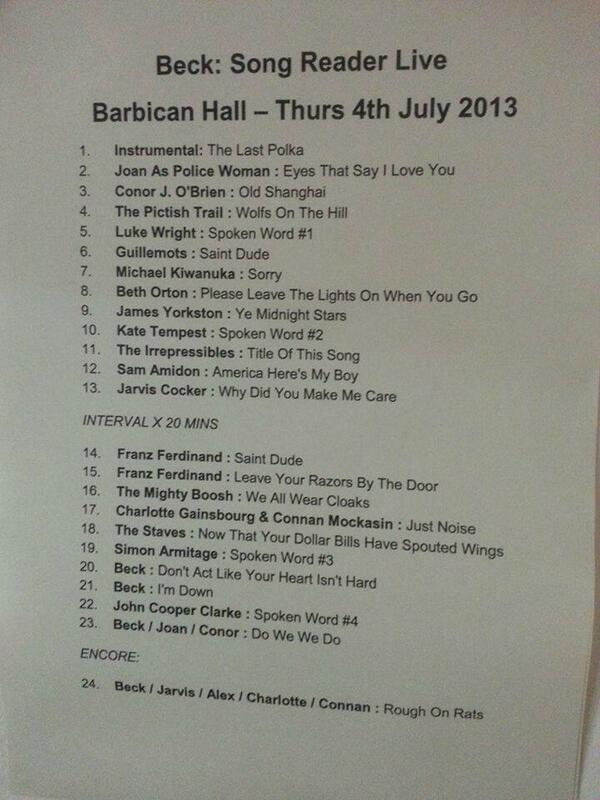 Here was the musical program: the ones with Beck in it will be listed below in our database. 1. Song Reader House Band "The Last Polka"
2. Joan As Police Woman "Eyes That Say 'I Love You'"
3. Conor J. O'Brien "Old Shanghai"
4. The Pictish Trail "The Wolf Is On The Hill"
7. Beth Orton "Please Leave The Light On When You Go"
8. James Yorkston "Ye Midnight Stars"
9. The Irrepressibles "Title Of This Song"
10. Sam Amidon "America, Here's My Boy"
11. Jarvis Cocker "Why Did You Make Me Care?" 12. Franz Ferdinand "Saint Dude"
13. Franz Ferdinand "Leave Your Razors By The Door"
14. The Mighty Boosh "We All Wear Cloaks"
15. Charlotte Gainsbourg & Connan Mockasin & Beck "Just Noise"
16. The Staves "Now That Your Dollar Bills Have Sprouted Wings"
17. Beck "Don't Act Like Your Heart Isn't Hard"
19. Beck & Joan & Conor "Do We? We Do"
20. Beck & Jarvis & Alex Kapranos & Charlotte & Connan "Rough On Rats"